The Great War, as it has been often called, has not been a great stamping ground for alternate history. To some extent, the popular perception of the war – essentially as a bloody pointless slaughter – has helped; it seems unlikely that much can actually change in the war itself. German victory timelines either involve a rapid defeat of France…or a victory in 1918, during the Kaiser’s Battle. People trying to criticize the conduct of the First World War have somehow to explain away the fact that the Allies actually won, shock, horror! Why might this be so? The first problem facing Germany lay in its strategic situation. The major powers that took part in the war were Britain, France, Germany, Austria-Hungary, Italy, Russia, Japan, America and Turkey. As it worked out, the Allies were Britain, France, America, Russia, Italy and Japan, opposing the Central Powers, which were Germany, Austria-Hungary and Turkey. This statement is actually somewhat misleading; America and Japan were either expected to remain out of the war or too far away to interfere properly. Italy, in fact, was expected to fight on the other side of the war; in any case, it didn’t really add enough to either side to tip the balance. Overall, this meant that Britain, France and Russia faced Germany, Austria-Hungary and Turkey, once Turkey entered the war. This meant that the balance of naval power lay squarely with the Allies; even if the Germans sought a battle at once, rather than the half-hearted affair of Jutland, they were quite likely to lose. Even a victory, assuming the Germans risked the encounter, would be so costly as not to change the situation at all; an invasion of Britain would be a risky pipedream. This has a second implication – the battles outside Europe were of no importance to the conduct of the war! It matters very little if the Japanese overrun Tisngtao or not; the Germans will either regain it in a peace settlement, or lose it if they lose the war. The same goes for the German islands in the Pacific, although it will have major implications for post-war development; the outcome there and in Africa simply cannot affect the outcome of the war. Assuming a level of German success – add in Boer factions, native revolts, etc – that borders on the fantastic, it cannot serve as anything more than a diversion from the western-eastern front. The main battle of the war will be fought out there. Turkey, of course, remains something of a wild card; a minor change during the early days of the war and Turkey may remain outside the fighting altogether, giving the Ottoman Empire a longer lease on life. However, even with the Geoben remaining away from Turkey, the British seizure of the Turkish superdreadnaughts, symbols of national pride, may well guarantee that Turkey enters the war. Regardless, it doesn’t matter; Turkey lacks the fighting power to influence events on the European battlefield. The division of spoils, post-war, will be determined whatever happens in Turkey. So, on to the western and eastern fronts. Germany faced France and Russia, backed up only by Austria-Hungary and a handful of smaller states, none of which can contribute more than local power to the fight. Serbia’s defiance will remain as irrelevant as it always was to the main struggle; the man who believed himself responsible for the war will never be able to influence the outcome. The important contest is France V. Germany and Germany and Austria-Hungary V. Russia. 1914 – the Germans launch their attack, marching through Belgium into France. Unfortunately, the German Army, while powerful, simply lacks the capability to pull off an offensive that moves fast enough to crush the French Army. The Germans have the added – and unexpected – disadvantage of the Russians moving quicker than they thought possible; the Russian army knifed into the German rear within weeks of the war starting. The Russians, of course, could not bring off a blitzkrieg either…but the stalemate ensured that neither side could win quickly. Any timeline would have to remove the BEF, damage the Russians, or something unexpected to produce a quick German victory. Even if everything goes perfectly for the Germans, they will not be able to destroy France in the first year. People, who state that the French are nothing more than cheese eating surrender monkeys, must note that this is 1914. The problems with the French army did not begin to crack open until later – 1916 – after several futile attempts to throw the Germans out of France. The French had plenty of fight in them – and, as the reports show, a modern army could hold a defence line against the Germans. In short, the Germans had to win quickly, or spend years trying to bleed out the French. As it happened, by the time the French were starting to become exhausted, the British army had reached a strength that could hold the line – and, in 1917-18, take the offensive. The situation was different in the case of the Eastern Front. As noted above, the Russians had actually managed to surprise the Germans – who sent some divisions from the west to the east during the opening weeks of the war – by hitting them in the rear sooner than they had believed possible. Once the war had settled down, however, the Germans needed to destroy the Russian army, which had plenty of ground to retreat into. By the time the Russians were finally destroyed, more through their own internal problems than the German attack, it was too late to give the Germans a chance to do more than catch their breath – they needed the divisions released on the western front. The circumstances that brought America into the war were so unexpected that it is easy to imagine a POD that removes them, leaving America out of the war. Despite that, at that point the British – and, to a lesser extent – the French, have actually managed to build an army that can defeat the Germans; the Kaiser’s Battle gave the Allies a few nasty moments, but – again – the Germans lacked the capability to defeat the Allies in a field battle. The absence of an American Army will certainly have effects on the political outcome of the war – absent Wilson’s naivety, more real politic will prevail – but it will not prevent the Allies from crunching their way to the Battle of the Hindenburg Line and placing the Germans in a losing position. It is possible to extend the war into 1919, but it is unlikely that the Germans can produce more than a local victory. Finally, the peace; France was determined to regain its lost territories. Britain had a strong interest in the German colonies. Japan, also, had such an interest. That Germany would be stripped of all such possessions was inevitable; their final disposition – mandates, straight land grabs, whatever – hardly matters to the text of this essay. Germany simply lacked the capability to win the war before being ground down out of existence. The only question was how long it would take for the Allies to win. Dale Cozort once compared history to a region filled with floodplains and valleys. 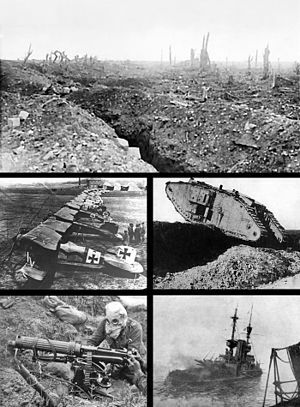 The ending of world war one was a floodplain, with dozens of possible changes, and to some extent so was the beginning. The course of the war, however, remains a valley; barring some unforeseen development, such as the development of tanks or the collapse of allied will to win, Germany must lose the war. Chris Nuttall blogs at The Chrishanger. His books can be found on Amazon Kindle. The accuracy of your assessment hinges on the Germans going through with the Schlieffenplan, Chris. If we place the POD at a strategic change in the German High Command towards a defensive posture in the west the whole thing cracks. The western German borders of 1914 are *perfect* terrain for the defensive warfare WW1 favors. Even if Belgium should join the Allies (Britain planned to violate their neutrality anyway) this favorable terrain extends as far as Aachen in the north. Well dug-in the even small portions of the German Army - which had the most machineguns of all modern armies at the start of the war - could have blunted or beaten back Allied offensives, freeing the bulk of German forces for action against the Russians and on the Balkans. The Russian Army, while numerous, wasn't in too much of a peachy shape. It's doubtful it could have staid as long in the war as it did when faced with the bulk of the Hungaro-Austrians *and* the Germans, especially considering that a single German army was able to kick them in the bud for close to eight months with the Battle of Tannenberg. However, this is most likely not possible, becuase all the armies of the time where lulled by the "School of the Offensive," which all the major continental powers subscribed to: France to reclaim Alsace-Lorraine; Germany to defeat France; Austria-Hungary to defeat Serbia and Russia to steam roll Germany and Austria. It just ended up that all these plans conflicted with one another, and they all had to be modified or scrapped: France ceased attacks on Germany to defend itself; Germany had to deal with Russia quickly; Austria couldn't break through Serbian lines due to German pressure, and Germany was unable to win its decisive battle. A defensive posture in the west doesn't mean a general shift to the defensive. What we have here is a change from a "France First" to a "Russia First" strategy on the side of the German General Staff. It's basically just a strategic switch, with the added benefit that the smaller covering force - now in the west, not the east - has favorable defensive terrain at its disposal. A few points for "war blogger. 1) How could the British have plans to violate Belgian neutrality when Germany's invasion of Belgium was the final excuse Britain needed to join the war? 2) The German army did NOT have more machine guns than the other armies at the war's outset. After their encounters with the British the Germans reacted to a mistaken belief that the British fielded more machine guns and increased throughout 1915, but that's after the war began. 3) While Tannenberg and Mansurian lakes were major victories; the Russian army were far from finished and still inflicted a humiliation on the German at Vistula River as well as proving more than a match for the Austrians. 4) Falkanhayn actually adopted your idea of neglecting the west and concentrating on the east in 1915. While it pushed the Russians out of Poland and eastward; it did not break the Russian army and only served to incur unaffordable German & Austrian casualties and stretch their supply lines, a situation Brusilov exploited in 1916. The Germans basically HAD to win outright in the West, at least by forcing the French out of the war. (No France, no BEF). They knew and planned for a 2-front war on the assumption that they could beat France before the Russians got mobilised. Heading east first would have been risky (from their point of view) as the French would have a chance to attack from the West. Their problem was always the danger of being crushed between two powers. One of them had to be destroyed first and the most dangerous one appeared to be France. The Germans might have concluded from Port Arthur and the American Civil war that a well-conducted defense was effective, and that the major threat to defeating them was to cut off their supply of fertilizer so that their population starved, as happened at the end of the war. Letting the French attack, making clear Serbian complicity in the assassination of the ArchDuke, and perpetually offering peace, was perhaps their path to victory. The other German victory path, after the Somme offensive, was to offer peace, as the Austro-Hungarians urged. The Austrian path to victory was accepting the Serbian start-of-war offer, and not allowing the march to war advance. In fact, matters were stable through 1916, when the German government tried a major ramp-up in combat power and wrecked their agriculture. An appropriate German-Austrian tactic was an offensive against the Russians, the objective being the Ukraine. If an offensive was wanted, a much stronger effort against the Italians to take them out of the war might have been more interesting than what they did. Yes, they could have learned from Port Author and other battles, but most of the evidence is that they didn't learn very much (and nor did anyone else). Going completely on the defensive would have risked losing if the allies had actually found a way to crack through the defence lines – as they did, with combined operations between tanks, aircraft and infantry in 1917-18. On paper, the allies were far more formidable than the Germans, which was at least partly why the Germans intended to knock France out of the war ASAP. Bevin Alexander in his book "Sun Tzu at Gettysburg: Ancient Military Wisdom in the Modern World" suggests that the Schlieffen Plan could have actually *worked*...had anyone in Germany actually understood what it was supposed to be - on the grounds that *then* it would have followed a Sun Tzu path to victory. But then, Alexander almost deifies Sun Tzu - and also apparently lives in a world where the old saying “No battle plan survives contact with the enemy” has, in fact, never been said, so I'm not sure how much weight his view on it holds. Although what you are saying holds some validity, I think its worth pointing out that the issues facing each side were much more complex than you're giving them credit for. Up until 1903 Serbia had a pro-Austrian monarchy that- coupled with Bulgaria having the same territorial aspirations as Russia, had the odds stacked in favor of a Central Victory. This being the result of Austria-Hungary not having to focus forces in the south before bringing them north to face Russia. Effectively, trying to fight Serbia first and then Russia forced Austria-Hungary to give up the initiative against Russia as well. And the fact that Austria-Hungary declared war on Serbia was the perfect pretext for Italy not joining in on the Central Powers' side during the war, another point where diplomacy and a more delicate touch could have worked better in the long run. The problem was in fact that the alliance between Germany, Italy, and Austria-Hungary was a defensive alliance and so by "being the bad guy" the Central Powers lost Italy as an ally, which could have very easily tipped the balance in their favor. As I said before the issues are alot more complex, but most have to with the events leading up to the war rather than the war itself. Essentially I think the key to any kind of WW1 Alternate History lies in the events in the Balkans leading up to the war, rather than with any of the major powers.